“Puppies, like young children, have short attention spans. Puppy training games are a great way to teach young puppies some of the very basic things they need to learn without boring them or getting heavy-handed with training. These dog games can be fun for both you and your puppy. Puppies, like young children, have short attention spans. They also learn much better if you can keep your training fun. They don’t even have to know that you’re training them. That’s why dog training games work so well. The games are fun, they are short, they don’t tax your puppy’s attention span, and they also give you and your puppy a great opportunity to bond. You can play puppy training games with your puppy with just you and your puppy participating, or you can invite a friend to play, too. It's usually best to play someplace where your puppy won't be too distracted by other things. Your living room, the backyard (if it's fenced), or anyplace where you and your puppy can play safely will be fine. All you need are some treats and whatever you're using for training, such as a ball or toy. You can use puppy training games to teach your puppy lots of things. One of the easiest things to teach your puppy is his name. Many people assume that a puppy just “knows” his name, but that's not the case. You have to teach your puppy his name. You can do this in a puppy training game by yourself with your puppy or with a friend. For example, you and a friend can sit in the floor with your puppy between you. Each of you should have some treats. Take turns using your puppy's name and call him to you. Your puppy should quickly get the hand of this game! When he comes to you, give him lots of praise and a treat, then have your friend call him using his name. More praise and treats! Play this game a few times and your puppy will know his name. You can also teach your puppy to come to you. You can do this by playing a game of hide-and-seek with your puppy in your yard. Wait until your puppy is interested in something else and then hide where your puppy can easily find you. Don't worry. Your puppy will notice you're missing and he'll come running to find you as soon as he does. You represent security to your puppy. When your puppy gets close to you, you should step out from your hiding place and call him to you, saying his name and "Come!" You can play this game a few more times, choosing hiding places that are a little more difficult. This is a good way to encourage your puppy to bond to you and stay focused on you. Teaching your Puppy to Trade Toys - more important than you might think! You can also encourage your puppy to exchange toys with you. This is a good game to play to lay a foundation for when your puppy is an adult dog and you want to be able to take something away from him. Encourage your puppy to play with one of his toys. When he's happily playing with his toy you should offer him a favorite treat as a swap. After the treat you can swap again and give him a favorite toy. Keep playing and swapping with him, alternating treats with toys. Your puppy should be happy to trade toys in exchange for treats and praise. This can be a fun game with your puppy and teach him that he should give up things to you when you ask. You can really set up many puppy training games with your puppy. 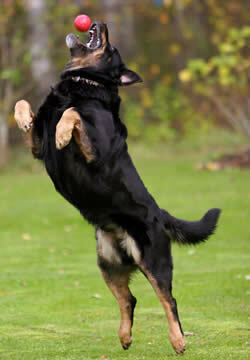 Dog training games are lots of fun for puppies and they teach good lessons. Keep the dog games fun, short, and don't try to do too much in one lesson. Make sure that your puppy is having fun. The games should be fun for you, too. Afterall, you're spending time playing with your puppy. What could be better than that? Dog Training Reminder: Positive dog training with its rewards, praise and positive reinforcement is far superior to using the harsh alternative. Physical punishment should never be a part of your basic dog training system. Dogs and Dog Advice has canine articles for owners new and old. If you need training tips and advice, help finding just the right name, or guidance when choosing the perfect breed, you will find it here. Have You Considered Adopting a Pet? With such a long list of breeds to choose from, some people have no clue what breed would fit their needs. If that describes you and you just want a nice family pet, adopting a dog from a local shelter or Humane Society may your very best option.. Copyright © 2007-2018 - Dogs and Dog Advice - All Rights Reserved - Reproduction without permission is strictly forbidden. Disclaimer: Dogs and Dog Advice is a participant in the Amazon Services LLC Associates Program, an affiliate advertising program designed to provide a means for sites to earn advertising fees by advertising and linking to amazon.com, amazon.co.uk, amazon.ca. Amazon and the Amazon logo are trademarks of Amazon.com, Inc. or its affiliates. We may receive a small commission if you click on one of our links and make a purchase. Thank you for supporting Dogs and Dog Advice and helping me make it the best site possible!